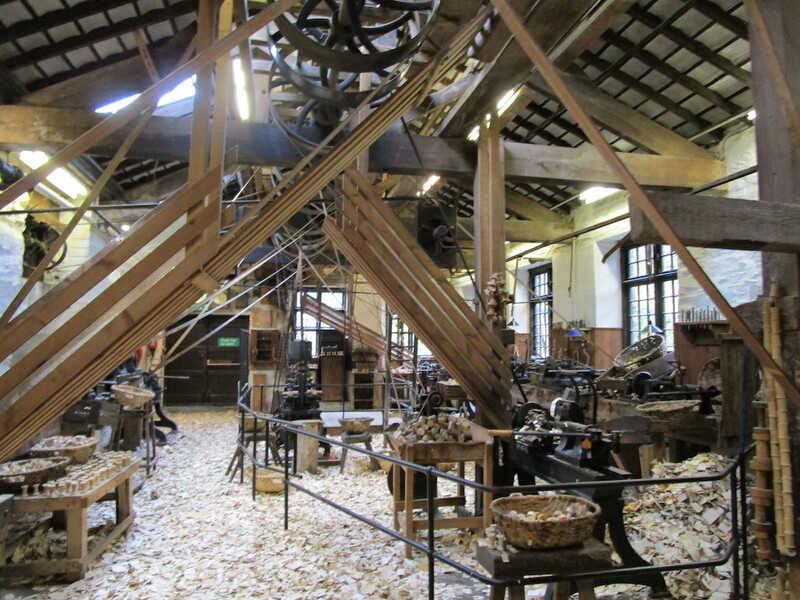 A trip to the Lake District this week for a look behind the scenes at Stott Park Bobbin Mill [pictured above] as the English Heritage property gears up to opening for the new season. It’s a story of industrial heritage, a rural Lakeland backwater that was home to the bobbin mills that served Manchester’s ‘Cottonopolis’. The Industrial Revolution-era industry has long since disappeared from the Cumbrian fells but Stott Park remains — the last working mill in Cumbria. The four-acre site provides a striking contrast to the surrounding Lakeland fells, the working mill set amongst woodland and dominated by a towering brick chimney. Unlike other nearby English Heritage sites, such as Furness Abbey and Brougham Castle, the conservation task at Stott Park is a very different proposition. Read the full story in the next issue of English Heritage magazine. Liked this? Try also The best time to discover Ruskin’s Cumbria. I spent a day just before the Easter break talking salt. No, really. Salt, it transpires, is a huge industry, especially in a town like Northwich, Cheshire, where the salt industry started with the Romans and fostered the development of its booming chemical industry today. I had come to Northwich for a press preview of the Lion Salt Works – it’s just one of a handful of industrial heritage buildings of its type across the world and it’s right here in the Northwest of England. The Lion Salt Works will re-open to the public as a visitor attraction in May after a four-year, £9.9m restoration project to save the crumbling historic site. It’s tough bringing industrial-heritage buildings to life but Paul Stockton [pictured above] made the work-in-progress site come alive with his stories of the daily grind. My full article will appear in Discover Britain magazine in time for Heritage Open Days weekend this autumn. 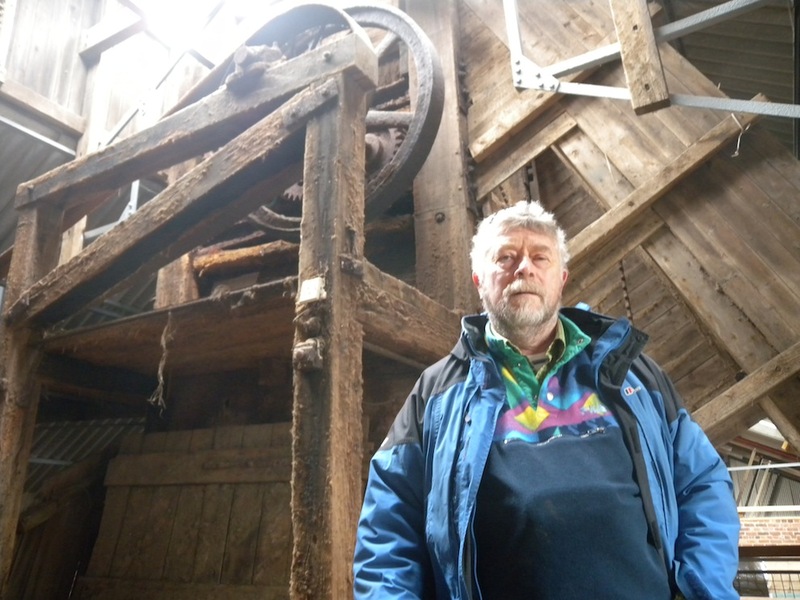 Paul Stockton was just 20 years when he came to the Lion Salt Works in Northwich as a student labourer. It was 1970 and Paul, who went on to work as a maths teacher, earned £5 per week, hauling 28lb blocks of fresh salt around the site. “It was very hot and steamy. The whole building smelt strangely clean but you could always taste the salt on your tongue,” he remembers of those days, stripped to the waist in boilerhouse conditions ‘lofting’ or hauling blocks of salt around the drying room. Liked this? Try also Guest blog for Heritage Open Days. * A lot of my stories these days are close to home and this is a good example of finding a story on my own doorstep. As ever, follow me on Twitter, or subscribe to the RSS, for weekly updates from my travel-writing archive in the months to come. We board the Great Blue Heron and we set sail through gentle waters. The 62ft narrow boat, well equipped with a cosy galley kitchen and twin bedrooms, makes steady progress at 4mph. There’s no hurry. Besides, we’re busy soaking up the tranquility and admiring the low-slung winter sunshine as it casts shadows over the bow. The day trip from Anderton Marina in Cheshire, cruising past the Anderton Boat Lift towards Manchester, takes us past bucolic farmland and chocolate-box villages, signs of spring birdlife bringing music to the Cheshire countryside as we drift by. But this is no ordinary pleasure cruise. Our journey along the Cheshire Ring, a circular route from Anderton, highlights the importance of the canal network to industrial Britain. This year it celebrates the 40th anniversary of a revived section of Britain’s 2,000-mile canal navigation network that had fallen into a state of disrepair in the Sixties. The Cheshire Ring reopened in April 1974 following the dedicated efforts of the Inland Waterways Association (IWA) and the Peak Forest Canal Society to restore navigation to the route. Today, narrow boats ply the route once more, the full loop including sections of six canals and passing from rural Cheshire to urban Manchester with stunning views of the Peak District and Cheshire Plain along the way. It takes ten days to complete, tackling 92 locks and travelling 97 miles – all in glorious slow motion. 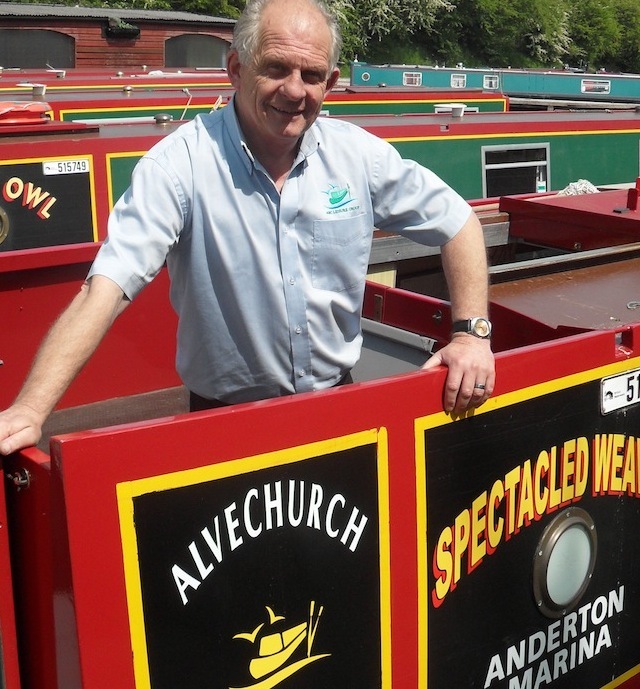 “It was a hub for transport from all over the north in its heyday – like the motorway today,” says skipper John Conifer [pictured above], Marina Manager at Anderton, who got the boating bug on a family narrow boat holiday. He now lives on a boat and has spent the last 25 years exploring Britain’s canal network. “The Ring has lift bridges, tunnels and aqueducts. It also showcases the role of canals in the Industrial Revolution with old wharfs and heritage buildings along the way,” he adds. We set off from the base at Anderton, joining the Trent & Mersey Canal, and follow the Ring in a clockwise direction towards Warrington and Manchester. Subsequent sections include the Bridgewater Canal through Lyme and the Macclesfield Canal through Congleton. But, for now, we just soak up the scenery. Swans swim past nonchalantly and ducks observe us from the ripple-lapped reeds. The birds are singing in the trees overhead to greet the arrival of the first signs of spring, snowdrops and daffodils illuminating the muddied towpath. The heyday of the canal network was the turn of the 19th century but the waterways soon lost out during the railway boom of the 1840s. Years of neglect followed but from the Sixties onwards the canal network started to be used for leisure with narrow boat holidays today a fast-growing sector. The Trent and Mersey Canal, an early pioneering canal known originally as the Grand Trunk Canal, was one of the trailblazers for the formation of the Cheshire Ring. “The canal was a major arterial waterway linking Hull and Liverpool with Staffordshire industries and bringing the Severn and the Thames into the inland navigation network,” explains Kate Lynch, Heritage Advisor at the Canal & River Trust. Of the other sections, the Rochdale Canal, a trans-Pennine waterway, opened in sections between 1799 and 1804, while the Ashton Canal, formed by an Act of Parliament in 1792, was completed in 1796. The Macclesfield Canal, however, only opened in 1831, one of the last canals to be built in Britain. The first leg of my journey from Anderton to Barnton Wharf sees the canal cut an unhurried swathe through a landscape destabilised by years of salt extraction. Indeed, a whole new section of canal had to be dug at Marston in 1958 to bypass a section plagued by subsistence. This section of the Ring is marked by two tunnels, Barnton and Saltersford, which were two of the earliest tunnels to hacked out of unforgiving stone by the crews of navvies (or navigators), the manual labourers who forged much of the canal network in the late 18th century. The kinks and curves of the tunnels testify to the arduous nature of the work to this day. After a while, John lets me take the tiller and get a feel for steering. It often takes first-time boaters a couple of days to get a feel for constantly correcting the steering but, after that, he assures me, it becomes second nature. More tricky, however, is negotiating the tunnels, pitch black aside from a couple of fresh-air-letting vent holes and some narrow enough to require a timed entrance. Northbound boats are allowed to enter the Saltersford tunnel for 20 minutes on the hour, for example, southbound similarly on the half hour. John holds her steady as we make for the proverbial light at the end of the tunnel, the sides of the water-dripping stone tunnels feeling perilously close in the gloom. He smiles. The next section, leading from Acton Bridge towards the 1,133m long Preston Brook Tunnel, where the Trent and Mersey Canal joins the Bridgewater, is one of the most picturesque legs to navigate. The canal progresses along a ledge above the River Weaver’s widening valley with views of rolling farmland interspersed with pockets of deciduous woodland. Dutton Locks comes into view on the horizon and beyond Joseph Locke’s imposing viaduct of 20 sandstone arches erected by the Grand Junction Railway in 1837. Moor up to get a closer look, taking the footpath over bridges, or push on to stretch legs away from the tiller at Longacre Wood, cared for by the Woodland Trust. Over mugs of tea in the galley, sat under a map of the 2,000-mile canal network across Britain, John explains his love of canal cruising. “The pace of travel forces you to slow down. You see things from the towpath you would never see from the motorway,” he says. Further along the route, the scenery shifts from countryside to cityscape with the Rochdale Canal leading through Manchester’s Chinatown, then along the Peak Forest Canal though Top Lock at Marple. Many sections offer opportunities to moor up for the afternoon and stretch your legs, walking or cycling along the towpath to a local attraction. Look out for Dunham Massey Hall with its working Elizabethan Mill, plus a 250-acre deer park, alongside the Bridgewater Canal. Or try the National Trust property Little Moreton Hall, located near Scholar Green on the Macclesfield Canal, with its 15th-century half-timbered design. Alternatively, for something more urban, moor up in the Castlefield Basin in the centre of Manchester and spend the afternoon exploring the nearby Museum of Science and Industry (MOSI), which showcases Manchester’s pivotal role in the industrial revolution. The Revolution Gallery, in particular, highlights local engineering breakthroughs, such as a 1775 prototype water frame machine for manufacturing textiles and a display about the opening of the Liverpool and Manchester Railway in 1830, the world’s first steam-powered railway. As we glide back into the marina late afternoon after a day afloat, I feel a new sense of calm from cruising through the nature-rich landscape. My cheeks are rosy red from all the fresh air. But, if I’m tempted to join the growing ranks of narrow boat enthusiasts, I’d better start saving now. The boats start from around £70,000 to buy. John can tell I’ve got the bug. “You can keep your foreign holidays,” he smiles. * This story was first published in Discover Britain Magazine in 2014. Liked this? Try Local Food Heroes in Cheshire.